For tonight’s light snow, the latest NAM QPF is 0.15 inches water, the GFS 0.10 and NBM 0.07. This translates into 1, possibly 2 inches of snow ending about 7 AM Friday. Tonight’s NAM and GFS have light snow starting late afternoon Saturday, quickly mixing with sleet and some freezing rain, then all rain during the early evening hours. There may be an inch or so of accumulation before the changeover, with higher amounts far northwest. Rain continues heavy through the night. Temperatures are now forecast to only reach the 40s overnight. With daybreak Sunday, rain changes back to mix of rain, sleet and snow as temperatures plummet to 30 by noon. Temperatures drop further as the day progresses. Precipitation also ends by noon. Accumulations as shown in the NAM graphic below still hold. Will have a better handle on specifics tomorrow. I did want to mention that many of the NWS research websites and experimental models are unavailable due to the government shutdown. For tonight’s light snow, this morning’s NAM is clocking in with a QPF of 0.15 inches water. The GFS 0.13 inches water. 1-2 inches of snow starting 10-midnight and ending about 7 AM Friday. For the weekend storm, IGNORE the graphic from the ECMWF I posted earlier. As I said, I think it’s overestimating the snow forecast big time. This morning’s NAM and GFS have light snow starting late afternoon Saturday, quickly mixing with sleet and some freezing rain, then all rain during the early evening hours. Rain continues heavy through the night. With daybreak Sunday, rain changes back to mix of rain sleet and snow. Minimal accumulations expected, even north and west of the city. NAM Forecast total snow totals by end of storm Sunday. For tonight’s light snow, the NAM is still clocking in with a QPF of 0.17 inches water. 1-2 inches starting 9-11 PM and ending about 7 AM Friday. There are considerable differences in the predicted thermal structure during the changeover. 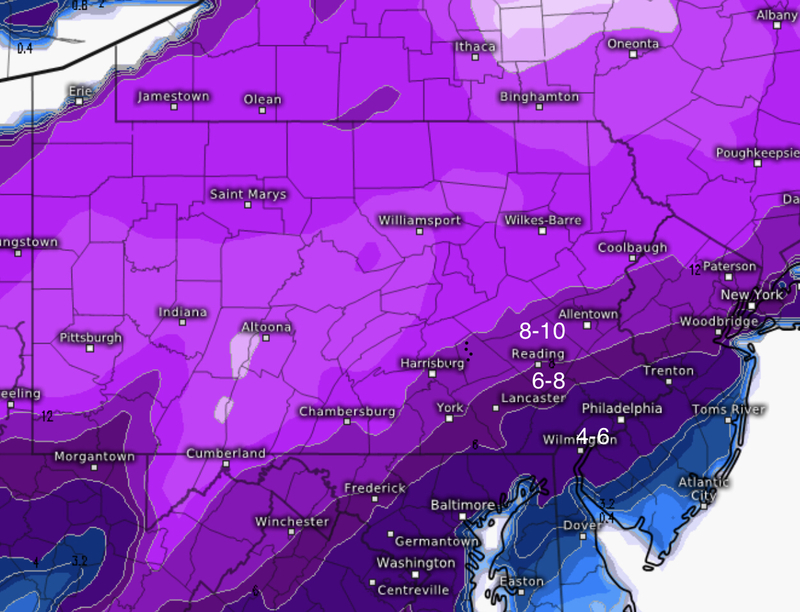 The latest European (ECMWF) has significant snow for Philadelphia. (See map below). I don’t currently think this is correct. ECMWF Snow accumulations by noon Sunday. 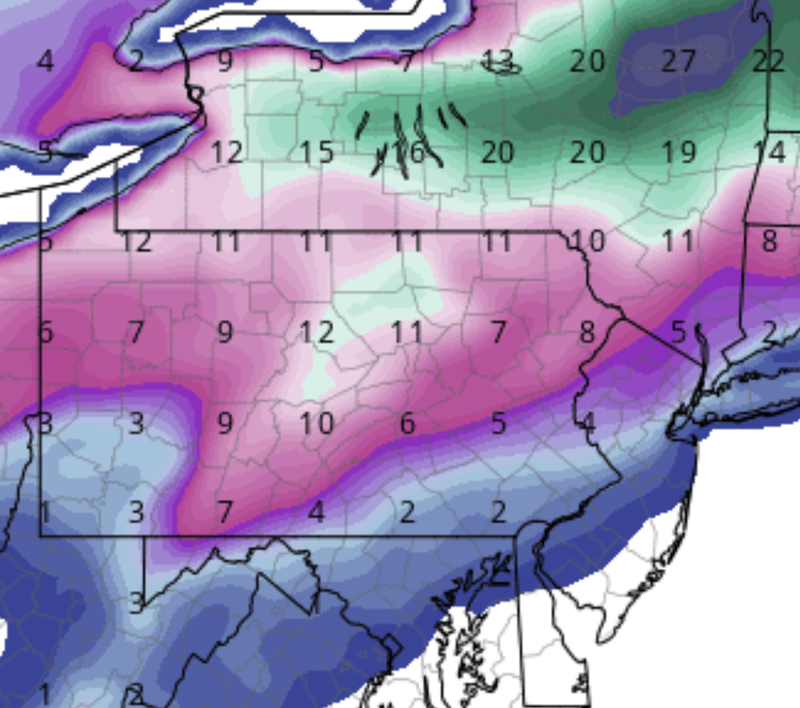 Based on the average NAM/GFS models, 2-4 in Philadelphia by Sunday noon. I think this may be too high as well. Stay tuned. Tonight’s NAM has the snow starting about 9pm Thursday night. QPF values 0.16 inches water. 1-2 inches of snow. Ending about 7 am Friday morning. Additionally, the Saturday night storm is depicted by the NAM to be even faster, exiting our area early morning Sunday, almost 8 hours faster than previously predicted by the GFS. (The NAM forecast range has just come into Sunday morning.) That would mean even less snow on Sunday morning. The uncertainty with this weekend storm seems less about track and more about phasing and speed. The trend is less phasing and more speed, faster exit.. Things continue to evolve with the storm for Sunday. But first, let me talk about the light snow for late Thursday night into Friday morning. A warm front type system will bring light snow, starting around midnight Thursday and ending about 7 AM Friday morning. QPF values range from 0.16 NAM to 0.14 GFS to 0.07 NBM. Most likely accumulation is 1-2 inches. The latest GFS and FV3-GFS have the storm moving faster. Light snow starts about 4-5 PM Saturday afternoon, but quickly mixes with and changes to rain. Later model runs will allow a better guess of how much snow will accumulate before the changeover to rain. Heavy rain Saturday night into Sunday morning. The rain will be accompanied by increasingly high winds. Late Sunday morning, a strong cold front will pass through; the rain will change to snow as temperatures drop from the 50s to the 30s by mid afternoon and into the 20s by 7 PM. While the total QPF is about 2.00 inches water, it now appears the the changeover to snow on Sunday will be brief and only about an inch or two of snow will accumulate in and around PHL as temperatures drop. It appears that the influx of cold air will cut off much of the moisture, reducing snow totals. Much of the precipitation will become spotty by late afternoon and should be over early evening. The big impact will be winds and rapidly sinking temperatures. Unclear how much icing will be a problem, but it’s likely since wet areas will freeze over. This storm forecast is still in flux. Stay tuned.